Servus and welcome to Our Creative Corner, dear crafting friends, true followers and visitors old and anew! First I started with stamping the single ferns and grasses with black archival stamping ink onto heavy white printer paper. I left enough space so each would fit with a separate rectangle (which I drew with a pencil and ruler). Then I cut them all out. I didn't see to same sizes, so you don't have to measure exactly. It's the right angles for the panels we are looking for. Next I applied three puddles of various Distress stains (Tea Dye, Weathered Wood and Tumbled Glass) on my non stick craft sheet. I love how the watercolour effect creates this "glow" in the centers of the panels! Then I blended the edges of my panels with DI "Gathered Twigs" (using the ink blending tool). For my background I used a square sheet of brown craft paper which I misted with water from the spray bottle and crumpled into a ball to create a highly textural surface to put my panels on. Once this paper had dried I sprinkled on some paints too and made the creases more visible by applying DI "Gathered Twigs" to them. I cut another square of the same size from some thick corrugated card (from left over packaging material) to mount my background to (using DecoArt matte Decou-Page). Then I arranged my stamped grasses and ferns on the panel and glued them in place too. I also added some brads (from Red Lead) for more detail. I still had one of those fab wood cut beetles (from Um Wow Studio), which I coloured with Distress paints (Wild Honey, Antiqued Bronze) and let dry. Once it had dried I used my fingertips to apply some DecoArt Traditions "Raw Umber" to the edges and wipe it around. Before that colour dried completely I took some of it off with a soft cloth. The beetle was glued in place with matte Decou-Page. As I had green and blue colour tones with my grass and fern panels I went for a contrasting colour with the beetle. This makes the greens and blues pop even more. The quote (from Hal Borland) was printed out on my computer, the words were cut out and the edges blended with DI "Gathered Twigs" before I glued them in place too. It says "Knowing trees, I understand the meaning of patience. Knowing grass, I can appreciate persistence." For a finish I added a piece of lace ribbon to the bottom of the wall hanging and a string of rough cord on top. I hope you like my wall hanging! I leave you with some more close-ups and I also want to remind you of our actual challenge "Summertime", which is still open until 11:55 pm on August 28th! This month we are shining the spotlight on the winner of the 'Flaming June' Challenge that was hosted by Julia! As usual, before we show you Shari's stunning creation - let's just spend some time finding out a little bit more about her..... and there is no better way to introduce this fabulous crafter than the introduction she wrote herself! Hi There!! 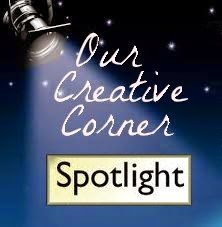 I'm Shari Trumbull and I'm SUPER DUPER excited to be a part of Our Creative Corner for this Top Talent spotlight. I was shocked and happy when Julia selected my 'June in Orange' tag as her top winner of OCC's June challenge - 'Flaming June'. There were so many wonderful creations in orange, that I just didn't think I'd have a chance! But, here I am, with this wonderful opportunity--Gosh, I hope I don't blow it!! I live in Sagle, Idaho-USA, which is in the panhandle of Idaho state, about 50 miles or so, away from the Canada/US border. I've lived here in Idaho with my hubbie, 3 dogs and 2 cats for 5 years now, moving from the Seattle, Washington area where I lived for over 18 years after transplanting from Southern California (from the hood to the woods is what I say!!). 2. How would you describe your art for the general public audience if they have never seen it before? Gosh, I guess I'd say I create "art of all trades"....I don't subscribe to any one particular genre of paper crafting, per se--I Love It All and love learning and trying new techniques whenever I can. Maybe experimental? 3. If you have lost your Mojo, how do you go about getting it back? If I find myself stumped and struggling (which may be more often than not), I usually take a break and go do something completely uncreative...like go outside and pull weeds during spring/summer--shovel snow during winter! I find, if I take my mind somewhere else (where I don't have to 'think'), I will eventually receive that "light-bulb" moment to get my mojo back in gear! 4. Do you pre-sketch a design or do you just wing it? How long does it usually take you to make a project? I don't pre-sketch designs, but, if there's a cool design out there that has caught my eye, I will attempt to recreate it in my own way, for my projects. Depending on the project, I could take a couple of days to make something, but other times, I'm so in the moment, that I can whip something out in a few hours! 5. What was the last thing to make you feel happy? 6. If you had to move to a state or country besides the one you currently live in, where would you move and why? Well, a different state....hmmmm, that's a hard one as the area of Idaho that I live in is beautiful...But, my dream country to move to is Italy. I'm a quarter Italian, and it's a fantasy of mine to learn to speak Italian (I LOVE the Italian language), so that I could go there and live and find my Italian-family roots. I'm also a quarter Norwegian, Welsh and German--all regions/countries that I'd like to visit and soak in! 7. Do you have any personal goals you have attained or would like to attain in the future? Oh yes and yes! I believe in setting goals for myself and I've set and attained quite a few, especially the 'big' ones I set for myself last year; Start a Blog (done), Send cards/tags to my fav crafting magazines for publication (done and still doing); Apply for DT spots for my fav blogs and stamp mfgs when they become available (currently doing); Take creative classes online (currently doing); Join in as many creative challenge blogs as I can (currently doing)--the list goes on! Setting goals for myself helps keep me focused and motivated. It's such a reward when I can mark things off of my Goal-To Do List! If Shari had made it part of her 'to do' list to amaze us with her creation then she can say she achieved her aim! - this is so beautiful! This is gorgeous Shari! So many beautiful details! It has been such an honour to feature you today at Our Creative Corner. Thank you for being such a wonderful Top Talent in the spotlight! If you want to see more photos and details of this wonderful creation and how it was made, then please go along to Shari's blog Aint That Artsy Fartsy and say "Hello" - I am sure she would love to see you there! All you have to do is enter the 'Summertime' challenge. There is one more week of the Summertime challenge left, so why not have fun creating! The moment I saw it I thought "Country Kitchen". I have a lovely Dutch friend, living close by, she regularly invites me for a coffee in her lovely country style kitchen, so decided to make a little gift set for her. 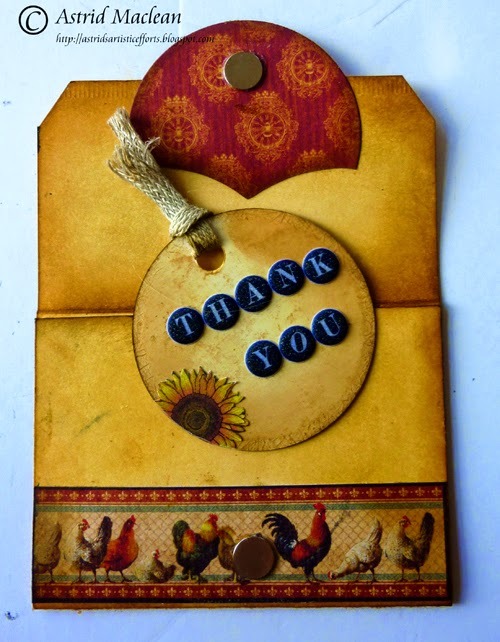 The set comprises out of a little memo board, a little tag holder and a thank you tag. I took a little wooden board, available from Calico Crafts and gave it 3 coats of Decoart Chalky Finish Paint in Carbon, sanding lightly in between coats. After it was completely dry I also sanded around all the edges for a bit of an aged effect. Next I stamped my image on smooth card stock in Black Archival, cut it out and then coloured it with a mix of Distress Markers and water-colour pencils. 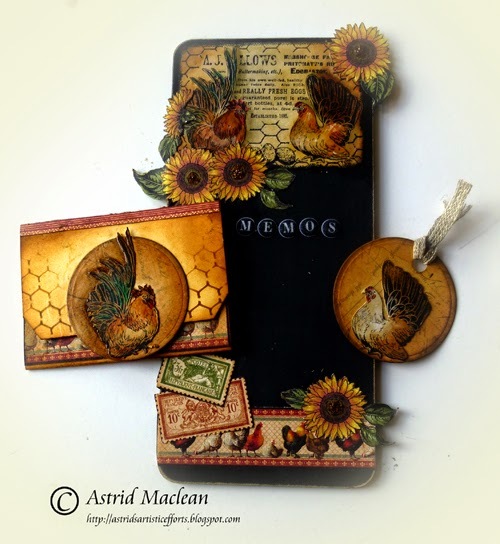 I then fussy-cut some sun flowers from the Graphics 45 French Country collection and arranged them around my stamped image. To balance the design out, I added some other elements from the same paper collection around the bottom of my board. The word memos came from some little letter stickers I had in my stash. 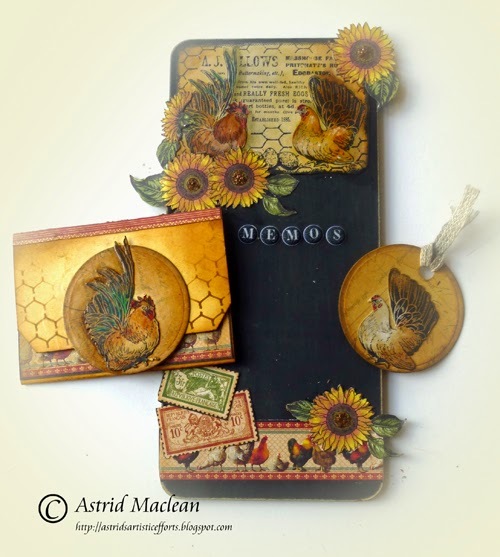 I also added a bit of Vintage Photo Distress Stickles to the centre of each of the sun flowers. For the tag holder I took a #10 manila tag and scored it from the bottom at 2.25 and 4.5". I punched out a circle at the bottom to make it easier to get the little tag out. 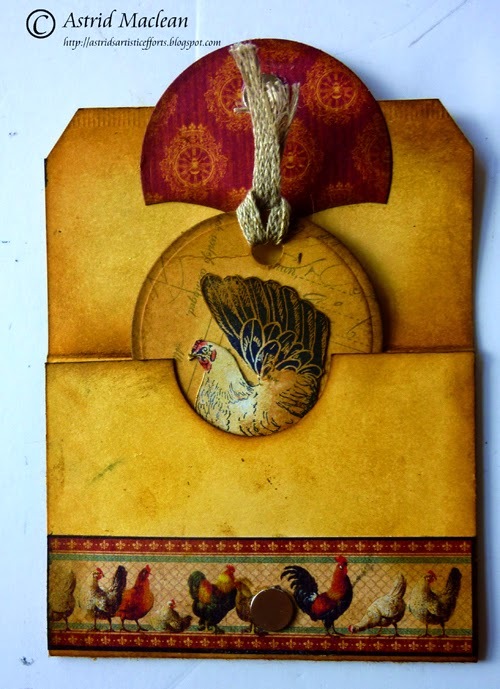 I coloured it with Antique Linen Scattered Straw and Vintage Photo Distress Inks and also added some stenciling and another strip from the papers. 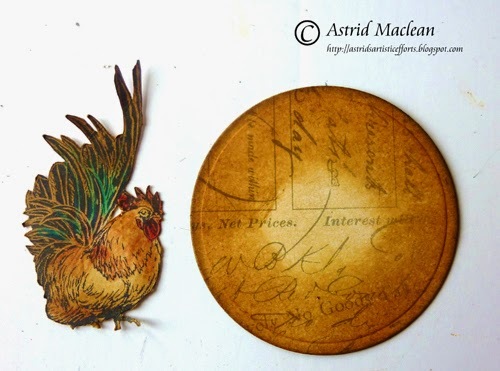 I die cut a circle with a Spellbinders Nestabilities die, stamped my stamp again and then cut out and coloured just the rooster and the hen. 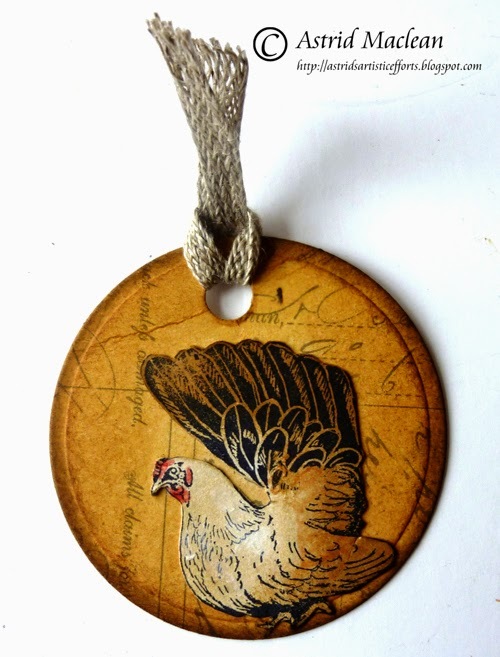 The rooster for the topper and the hen for the tag. I coloured them with the same colours. Here is the little tag and below you can see the folder after I glued it together and added the topper. Below you can see the holder from the inside. It closes with a little magnet. For the backing of the topper I simply cut another circle from the papers and then shaped it a bit with a Tim Holtz on the edge die, but of course you could do this in any way you like. Well, hope you like my little gift set, I love making little craft projects like this every now and so often and this stamp was just perfect for it. Thank you for visiting and don't forget to come back on the 22nd to meet our latest Top Talent! Also on the 25th Claudia will be sharing another Crafty Individuals project and you won't want to miss that!! Welcome back! Today we get to meet Our Creative Corner's Guest Designer for August! I am so proud to introduce Candy Colwell, one of the most talented artists in crafty blogland and one of the kindest, loveliest people ever....I have adored her work since I first started blogging. You can imagine how thrilled and honoured I was when she accepted my invitation to be my Guest Designer this month!!! 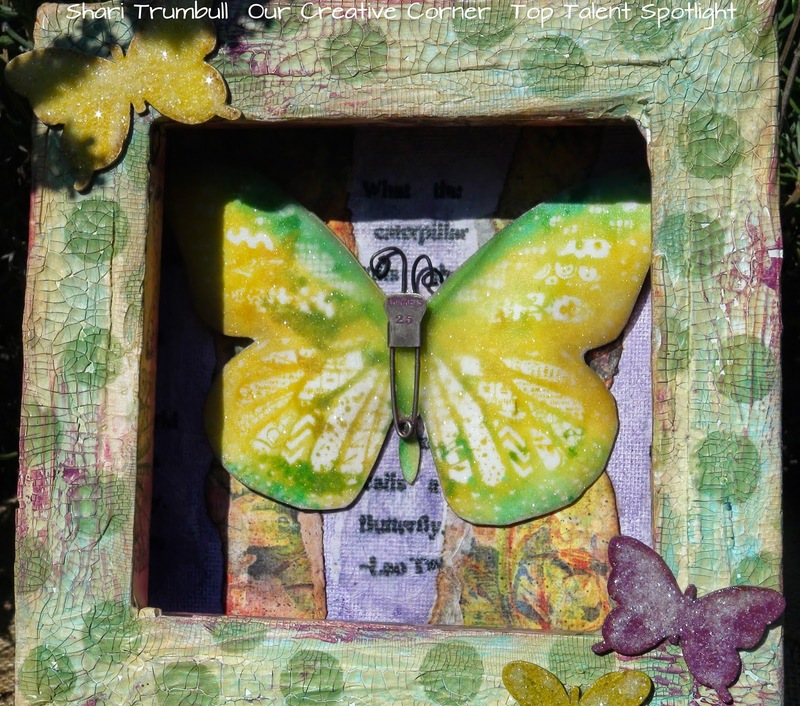 I am Candy Colwell of Creativity Is Contagious and I am thrilled that Laura asked me to be a Guest Designer for this month's "Summertime" theme. We are asked what sparks our imagination when we think of the word "Summertime". For me, what immediately comes to mind are bright sunny skies, the sweet songs of chattering birds and butterflies fluttering from delicate flowers to feathery greenery. 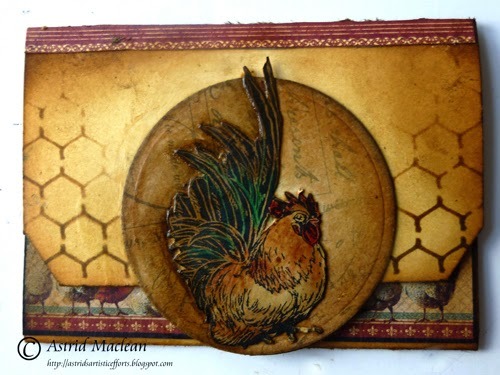 So I have created a sweet album featuring one of my favorite things; Tim Holtz' Small Folio. I will tell you now, there are a lot of photos in this post so grab a cuppa and enjoy! This small folio is covered with what is probably my favorite Tim Holtz paper stash release, Wallflower. Those papers have such gorgeous vintage images of all of my favorite things; flowers, birds, butterflies and other beautiful ephemera images. They were perfect for this summertime themed piece. I love the versatility of Tim's folios. They have a sturdy outside covering, perfect for covering with papers and adding your own special style through mixed media art. The interior offers plenty of space for dimensional embellishments and a kraft waterfall insert that is perfect for adding all sorts of extra "pages" using ephemera, envelopes, tags, or whatever your heart desires. I created all of my inset pages first and then covered the folio itself. You will see what I mean as this blog post continues. 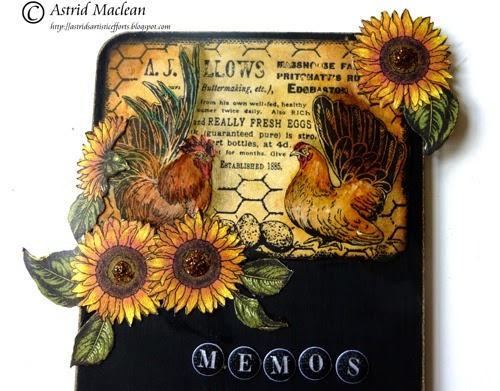 For more information and a video with Tim Holtz sharing some beautiful finished folios, click HERE. (You can click on the photographs to get a larger look at the details of each page). I created what would be the focal point of the next page. I started out with Tim's smaller set of Cabinet Cards and a vintage photo of this sweet child from Tim's Found Relatives. The Cabinet Card on the right is what they normally look...all clean and pretty. The one of the left is how mine looked after I altered its appearance by grunging it up a bit. To do this, I first lightly sanded the entire card top. It comes with a sort of slick finish and sanding it gives it "tooth" for inks to stick to it easier. Then I added some Gathered Twigs Distress Ink around the oval opening and also around the exterior edges. I lightly did my glue trick (that I did on the book cover) in a couple of spots and then added Black Soot Distress Ink at the edges. I glued my photograph in place and then lightly added some detailing with Mercury Glass Stickles. I added more elements to this little guy as I finished out the page and you'll see those soon. I covered the back of my Bird and Nest book cover with another of the Wallflower papers and using Jet Black Archival, I stamped some random flourishes using Tim's Fabulous Flourishes stamp. I distressed the paper using my glue stick technique and Gathered Twigs Distress Ink again to randomly age the paper. Then I added Black Soot at the edges for a more worn look. I am in love with Tim's Found Relatives cards. I love this little girl as well and thought she would be such a beautiful little butterfly. So, I cut her out and colored her using pink chalk to colorize her dress and bow in her hair. Then I inked around her edges using a Chestnut Roan Cats Eye Ink Pad. Here's a tip: you always want to ink your cut edges of paper when doing vintage work. Exposed white paper edges definitely do not give your piece a vintage look! 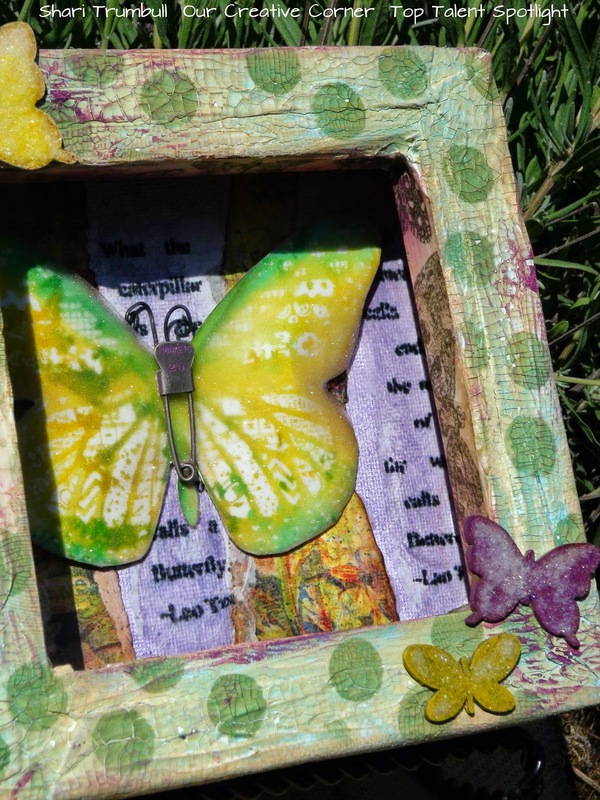 I had this butterfly image and liked the shape of it to create wings out of book text for my little girl. To finish out this page, I used that bird's nest and eggs image again. I colored the eggs with Weathered Wood Distress Ink and a Detailer Water Brush and made a slit behind them using a Kraft Knife. Then I slipped my little girl's legs behind them and glued them in place on the underside of the paper BEFORE I glued the paper in place on the kraft cardstock page I'd created to attach to the waterfall insert. I added some Washi Tape with butterflies on it at the top because I loved the little pop of color it provided. I also placed a little piece of lace behind my butterfly girl and on top of the nest and gave her a "BELIEVE" banner to hold. I added "FLY" from Tim's Ransom Alpha Parts letters. They are originally black but I dabbed a Gold Paint Dabber on top of them to give them a gold appearance and also a textured surface. I also added some Washi Tape to the left edge with some wonderful little vintage images on it. I colorized the tape with Broken China Distress Ink followed by a little light smearing of a Gold Paint Dabber. I would later add a Hitch Post and a Monocle to the upper right section of the page. You will see that later in this post. This is the focal point of the back side of my little butterfly girl page. The entire page is created from a section from a 12 x 12 paper. 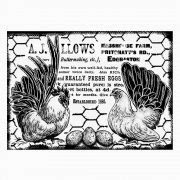 I carefully cut around the birds with a kraft knife so that I could slip my vintage image of the Willimantic Thread ephemera underneath them. I sized the ad to fit my page and then I layered it on top of a piece of cardstock that I'd cut out and created a tab on the upper left side. I sewed it together on my sewing machine because I love that look. Here is the entire page with its layers of papers, a bit of Tim's Trellis Frameworks on the left side that has been colored using Broken China Distress Paint and distressed with Gathered Twigs Distress Ink. I added the Victorian Velvet colorized vintage lace across the top using 1/4" Scor Tape and also a piece of vintage lace and a File Tab with "secrets" at the top of my Willimantic ephemera. 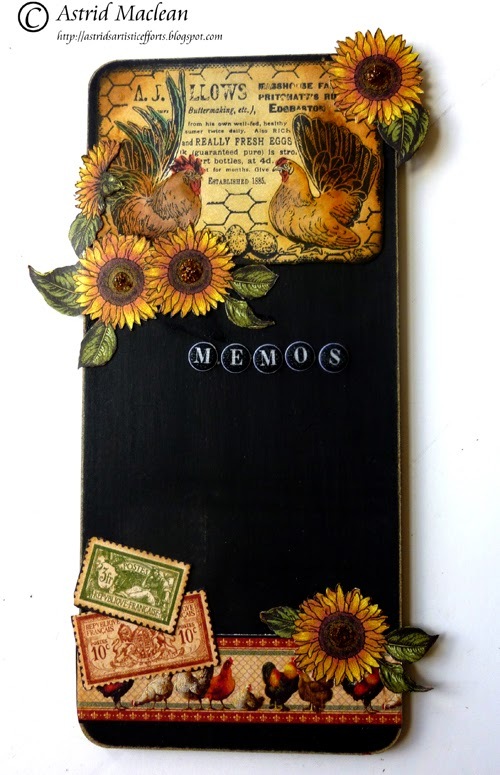 Finally, I added "life moments" stamped onto Vintage Photo Distress Cardstock using Jet Black Archival Ink and images from Tim's Simple Sayings stamp set. I later added a Journaling Ticket with a Remnant Rubon number "4" to the left side. Across from my page above is this tag. I covered a tag with Tim's Tissue Tapes and then lightly covered those with Victorian Velvet and Broken China Distress Paints followed by a top coat of Picket Fence Distress Paint. I stamped Tim's beautiful lady from his Nature Walk stamp set onto Specialty Stamping Paper and colored her using a Detailer Water Brush and Scattered Straw and Tattered Rose Distress Inks for her skin tones and also the blush in her cheeks. Worn Lipstick gives her that color in her lips and Faded Jeans creates her blue eyes. I cut her out and glued her onto the tag. Next I heat embossed "journey" from Tim's Traveling Friends stamp set and Black Embossing Powder. I used some old Making Memories Rub On letters that I had to create the rest of the sentiment. I die cut the edge of the tag using Tim's Ornate On The Edge die cut and added the metal band from Tim's Industrial Borders. After I completed the other side of this tag, I machine stitched around it and attached it to the waterfall insert using Tim's Mini Attacher. Here is the backside of the "life is a journey" tag. The background for this tag was created using Scattered Straw and Gathered Twigs. I used Tim's Spritz and Flick method to create the mottling in the background and then added the spritzes of color with my Broken China Distress Marker and Tim's Distress Marker Spritzer. I stamped the butterfly and the sentiment from Tim's Fairytale Frenzy stamp set. 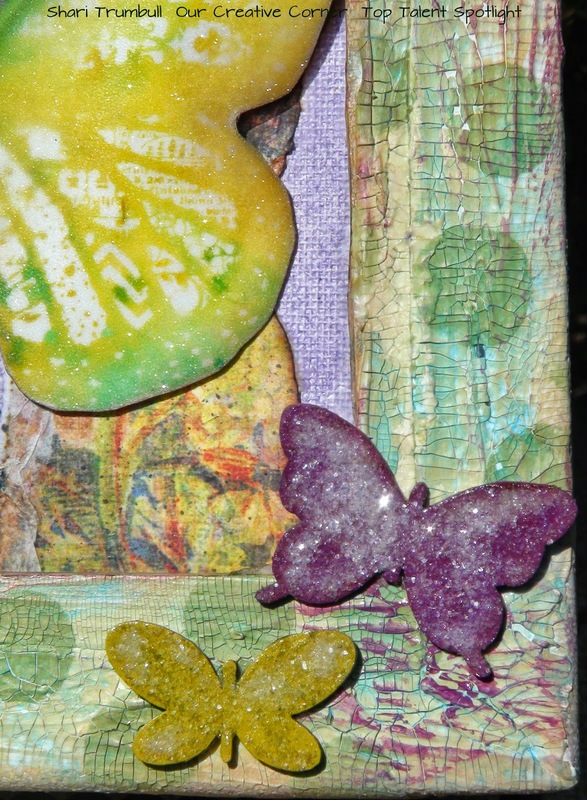 The butterfly's wings are colored with Broken China and a Detailer Water Brush. I also added some bits of Tim's Tissue Tape. Notice the black stamping on the kraft waterfall insert to the right of the tag? This is a simple and easy way to embellish those tabs if you don't want to completely cover them with paper or add some sort of mixed media technique to them. Another really fun and easy thing to make and add to a folio are library card pockets. I covered these two pockets with papers from Wallflower and then added some of Tim's Remnant Rubons. Then I simply added some 1/4" Scor Tape to the backs of them and attached them on top of the next kraft waterfall tab. See how easy the construction of these "pages" are? And here is the other side....the side that I eventually liked better so it would be the front of the next page. It's not finished in this picture...but I really liked the way it was going. I stuck several little feathers inside of the egg strip and added the letters "soar" from my Making Memories Rub On Letters. The paper is distressed with Broken China and Wild Honey. There is also a pocket created at the bottom of the page. Before I secured my feathers in place permanently, I machine stitched around the tag. I covered the exterior and interior of my folio with beautiful papers from Wallflower. I collaged some of the sheets by tearing and distressing the edges. 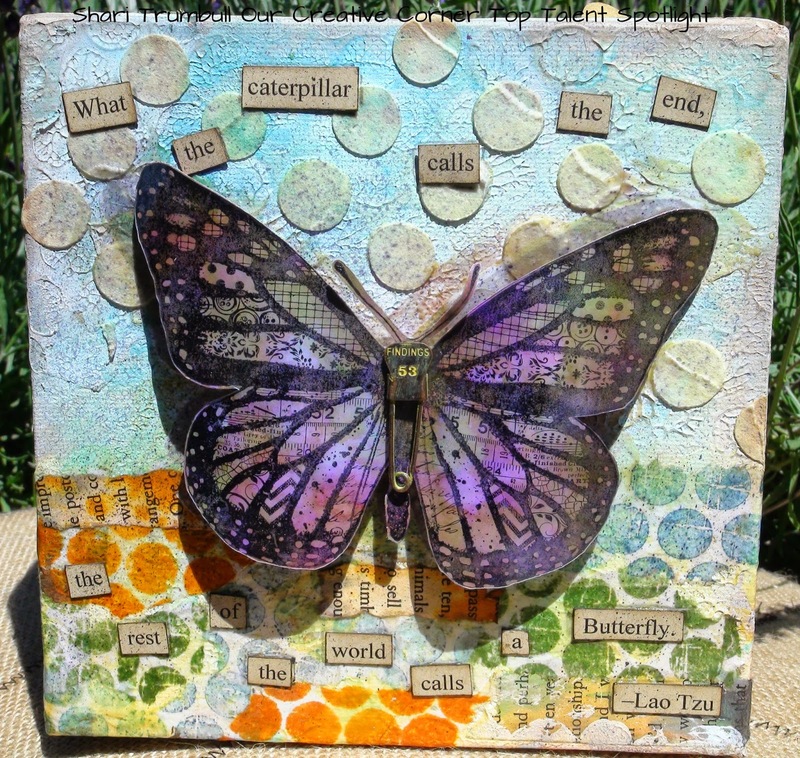 I also added some more of that beautiful colored butterfly Washi Tape to add little pops of color and more butterfly images here and there. And don't forget to cover the flaps on the ends as well! These are blank right now but I can always add photographs, stamping or more ephemera as I continue to add to this little folio. Now that the folio was covered, it was time to put it all together. 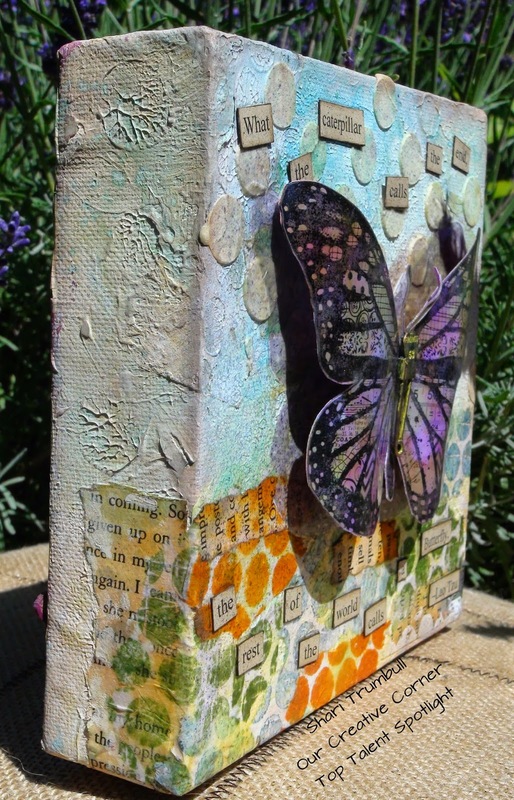 I added another layer of the butterfly paper to the bottom of my waterfall insert and placed it on top of the original one at the back of my folio because I love that butterfly image and I wanted it to be what I'd see when I flipped through my interior pages. So I added strips of 1/4" to 1/2" Scor Tape to the back of the butterfly paper and then pressed it into place right on top of the same paper on the back of the book. Wha-lah! Interior pages in place! Now it was time to add some of my own personal touches to the exterior of my folio. So, I added some of Tim's Organza Ribbon Roses Trimmings using 1/2" Scor Tape. I added a piece of vintage lace to what would be center of the spine of the folio and I added some Texture Paste through Tim's Harlequin Stencil to the front of the folio. I lightly brushed some Gesso over the entire cover and added hints of Broken China, Wild Honey and Victorian Velvet. Finally, I distressed around all of the edges using Gathered Twigs and Black Soot at the edges. I also used my glue stick technique on the back side, just to add a few "age spots" among those gorgeous flowers. For the front cover of my folio, I added this sweet little girl holding a song bird in a larger Cabinet Card of Tim's. I aged the cabinet card here in the same way I did on the one I used in the interior. I added a piece of Tim's Tissue Tape to the photograph and as you will see on the finished cover, I also added a piece of vintage lace for a softer look. I created the little picket fence out of craft sticks that I painted with Picket Fence and then lightly distressed with Gathered Twigs. I created the fence look by wire wrapping them together. I added a piece of cardstock to the bottom and hot glued moses and bits of excelsior grass to it. I also added some sweet summery flowers to the finished piece once I had glued it in place. Now that you've seen the construction of the book, let's have a flip through of the finished piece. When you put it all together, it's like something magical happens when you open the cover. Here is the way the folio looks when you open it up. 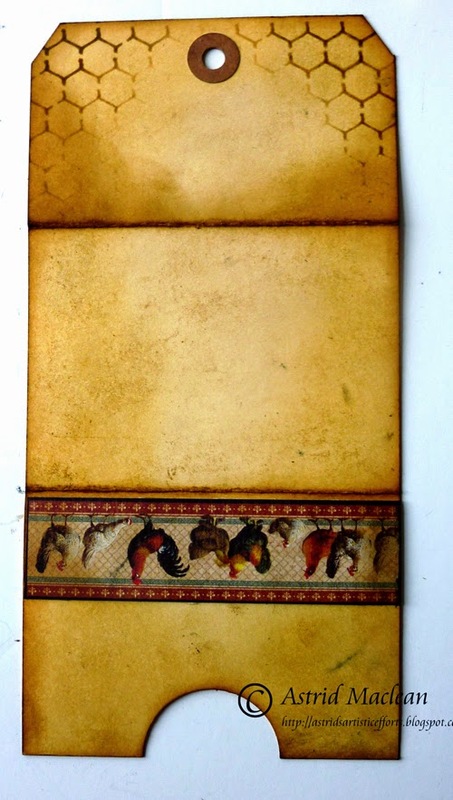 The interior cover is created from a bit of colorful birdie Washi Tape across the bottom and yet another Cabinet Card (distressed in the same manner as the other two) in the center. I have made another pocket out of the Cabinet Card and added a tag. The sweet little girl holding the nest is an image I found on the internet and sized to fit my card. The little metal arrow to the lower left is from Tim's Industrial Borders. Here are the finished next two pages, complete with filigree metal butterflies and little dimensional roses colored to enhance the colors in the folio. 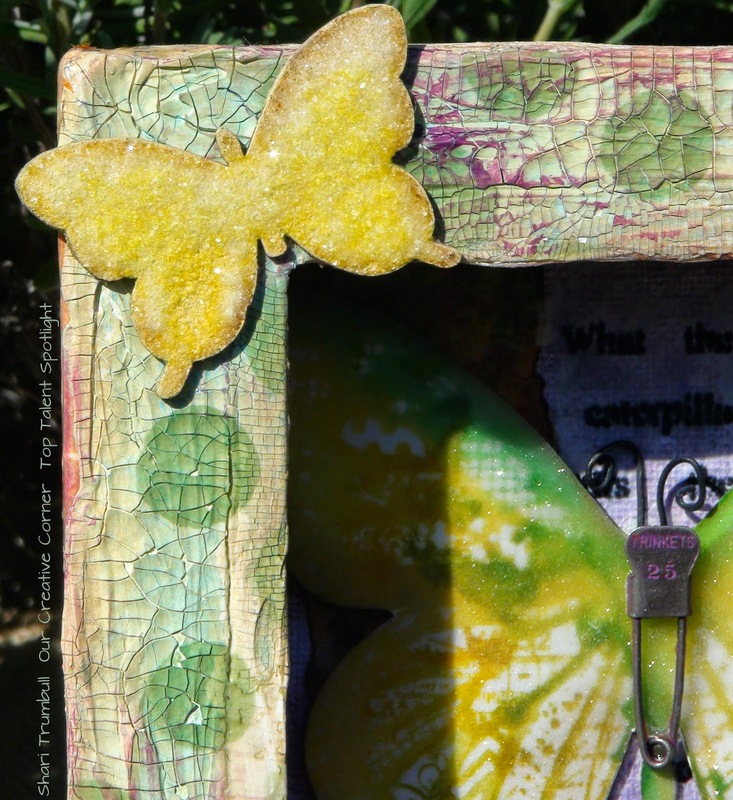 The little butterfly girl has the added Monocle with Tim's Remnant Rubs Words sentiment dangling from a Hitch Post and the Journaling Tag with the Remnant Rubs hand and sentiment attached. It's the little details that make all the difference! And here are the next two pages. Even just a tag being used as a page works because of all of the other things around it ... the covered library pockets behind it and the full page to the left of it. I think that the variety in the size of the pages of the waterfall and the interaction of them are what makes these little folios so special. The last page and the back side of the tag that I ended up adding this sweet sentiment and the beautiful long strip of ephemera from the Wallflower paper stash. On the side opposite from what would be considered the spine of the folio, I added this piece of large Washi Tape that looks like a filmstrip. Before I glued it in place on the folio, I added Broken China Distress Ink to color it. 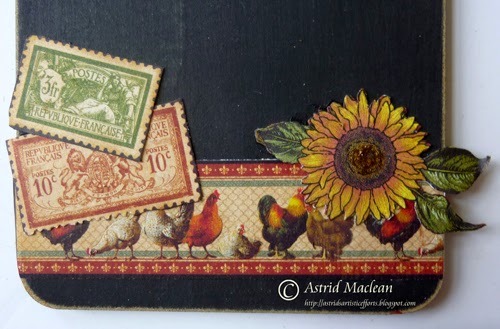 Then I added the sentiment, letters and vintage bird stamps in each section using Jet Black Archival Ink. Since it was already sticky on back, I simply just pressed it in place. Here are the two tags that I created for the inside of the folio. They are stamped using a variety of stamps that I have. I love the birds! They are from Crafty Secrets. Here is the finished exterior of the folio. You see the elastic straps that hold the folio closed. These were removed during the construction of the folio and then easily replaced upon it's completion. You just have to use your Kraft Tool to poke holes through the paper you cover the folio with and then thread them back into place. Here is a closeup of the finished cover. The first thing you will notice is the addition of the sweet summer flowers. They add so much, don't they? I also added "sweet life" Remnant Rub words at the top of the Cabinet Card and a bit of the left over Trellis Frameworks piece behind the Cabinet Card. I also added a Filigree Metallic corner from The Funkie Junkie Boutique and a small rhinestone button to the upper left corner. I added metal wing from Tim's Regal Adornments to the upper right corner. It was been altered from an antique silver finish with the addition of Treasure Gold Green Amber Guilding Wax and a small pink rose. I have threaded a "CURIOSITIES" Word Band onto the elastic band and dangled an Enamel Tag with a Remnant Rub On Bee from the Word Band. So there it is, my ode to summertime and my contribution to Our Creative Corner. I would like to thank Laura so very much for asking me to be a Guest Designer for her. I think her art as well as ALL of the members of Our Creative Corner's design team are such talented artists, so willing to share their art and their creativity with everyone. I am thrilled to have been asked to share my art with all of you. I hope that this piece has somehow inspired you to create something reminiscent of our summer that seems to be fleeting all too quickly and join in on the "Summertime" challenge!